The car of Doctor Desourteaux (a Peugeot model 202) on the Champ de Foire (Fairground). 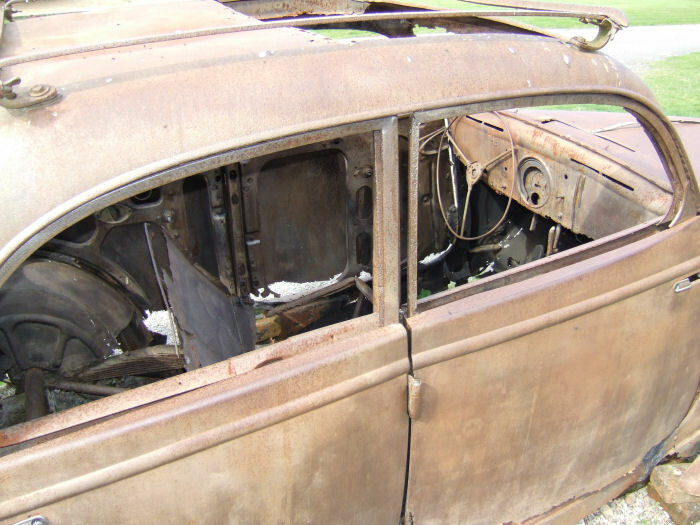 According to Sarah Farmer in her book, Martyred Village, this is actually the car of the village wine merchant. The Doctor's car was moved from the Champ de Foire to his property several days after the massacre. As can be seen the vehicle is gradually fading away and all the original paint has long gone, as have most of the interior fittings. The preservation of such remains is going to become a major problem for the future, as inevitably they will decay and crumble away. See also, the car from the rear and from the front (there is also a higher definition version of this picture).